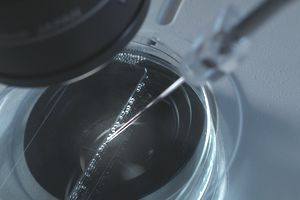 DNA microinjection methods are used to transfer genes between animals and are a popular technique for creating transgenic organisms, particularly mammals. The information in DNA is stored as a code made up of four chemical bases: adenine (A), guanine (G), cytosine (C), and thymine (T). Human DNA consists of about 3 billion bases, and more than 99 percent of those bases are the same in all people. The order, or sequence, of these bases, determines the information available for building and maintaining an organism. This system is similar to the way in which letters of the alphabet appear in a certain order to form words and sentences. DNA bases pair up with each other (i.e., A with T and C with G) to form units called base pairs. Each base is also attached to a sugar molecule and a phosphate molecule. When the three are put together (a base, a sugar, and a phosphate) that is called a nucleotide. Nucleotides are arranged in two long strands that form a spiral called a double helix. The structure of the double helix is somewhat like a ladder, with the base pairs forming the ladder’s rungs and the sugar and phosphate molecules forming the vertical sidepieces of the ladder. In DNA microinjection, also known as pronuclear microinjection, a very fine glass pipette is used to manually inject DNA from one organism into the eggs of another. The best time for injection is early after fertilization when the ova have two pronuclei. When the two fuse to form a single nucleus, the injected DNA may or may not be taken up. The University of California (Irvine) Transgenic Mouse Facility reports an estimated success rate of 10 percent to 15 percent based on experiments with mice testing positive for transgenes. If the DNA is incorporated into the genome, it is done so randomly. Because of this, there is always a chance the gene insert will not be expressed by the GMO, or may even interfere with the expression of another gene on the chromosome. Following DNA injection, the ovum is transferred into the oviduct of a recipient female, or foster mother, that has been induced by mating with a vasectomized male.